A collective “wow” echoed throughout the energy efficiency industry this week when Google announced its purchase of thermostat maker Nest for a smashing $3.2 billion. It is the first marquee deal to emerge since tech ventures began grasping for the new prize in energy: the home efficiency market. The game has been to figure out how to get enough homeowners to save energy so that the kilowatts add up to megawatts and truly influence energy markets. Nest, with its Learning Thermostat, thinks it has the answer. And Google apparently agrees. The home energy efficiency industry is now clearly on its way to scale thanks to its courtship with Silicon Valley. This is good or bad for utilities – depends on the utility. Home energy efficiency smart gadgets and cloud devices are acquiring an IPhone kind of cool. Automation is key. But don’t expect it to be all uphill from here. It’s a tough market. Consumers get bored fast. For Google’s part, it is looking for new growth markets, and seems to have found it in Nest, according to William Prindle, vice president for ICF International. Google has tried before to get into the energy monitoring business with a software product, PowerMeter, which it dropped in 2011 amidst problems getting access to customer utility data. “Nest gives them a direct line into users’ data, though what kind/how much data remains to be seen,” he said. Prindle pointed out that Google “would rather work with utilities than against them.”And Elliott noted that Nest creates an “attractive path for implementation with utility programs.” National Grid, Austin Energy, Southern California Edison and others already are partnering with Nest, providing rebates for the thermostats and offering its “Rush Hour Rewards,” an automated demand response program. How can utilities remain active players as the competition heats up? Stay agnostic, let go of the commodity model, and become a service business, Tuck said. But for those utilities fully in the energy efficiency game, the Google/Nest deal underscores their mission. National Grid, which invests more money in energy efficiency than any other U.S. utility except possibly PG&E, had positive things to say about Google/Nest. “This partnership could be an example of how a free market and competition can influence technology development and innovation, ultimately leading to more customer choice, input and ultimately energy independence,” said Fred Kuebler, director of U.S. Media Relations for National Grid. The deal also underscores the movement in the energy efficiency industry to think more like Apple – to create products with strong consumer appeal. Nest co-founder Matt Rogers is an Apple veteran and one of the early engineers who worked on the iPhone. Nest aimed for an Apple-like simplicity and intuitive design for its thermostat. For example, users don’t have to program temperature settings on a Nest thermostat; it learns based on their early settings and builds a personalized schedule. Mei Shibata, co-Founder of ThinkEco and partner at utility consultancy Akasaka, says that the $3.2 billion price tag sends a message to consumers that they are doing the right thing if they are pursuing energy efficiency. But don’t think the work is done selling energy efficiency, she warns. Consumers are easily distracted. “I think the pendulum will continue to swing back and forth for a while longer. Yes, this acquisition shows that connected home devices have entered the mainstream and are mature enough to interest the Googles of the world. Yes, I think that consumers are engaging with their devices and finding the two-way feedback on energy savings cool. But I don’t believe it’s a permanent shift yet,” she said. ThinkEco, maker of the modlet, has been working for three years with Con Edison on an air conditioning demand response program, coolNYC. During that time, Shibata has seen consumer interest wax and wane. So what does Opower think of the Google/Nest deal? If you found this story interesting, please sign up for Energy Efficiency Market’s free, twice-weekly newsletter here. Sign up for our newsletter and get the latest microgrid news and analysis. Elisa Wood is the chief editor of MicrogridKnowledge.com. She has been writing about energy for more than two decades for top industry publications. Her work also has been picked up by CNN, the New York Times, Reuters, the Wall Street Journal Online and the Washington Post. Do you think Google would be interested ? North America was pummeled this year with Hurricanes Harvey, Irma, and Maria. As devastating as these events were, none compare to the threat of a major cyber attack on the American electrical utility grid. 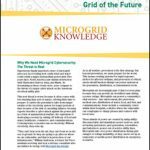 Download the new report from Microgrid Knowledge, courtesy of S&C Electric Co., that explores the threat of cyber attacks and why microgrid cybersecurity is crucial to the grid of the future.